We like you! We really do! So that’s why we want to make sure you stay up to date on all the latest and greatest info from LINE on Facebook! With recent updates to Facebook’s fancy math algorithms, we don’t want your chance to win gear or see the latest edits from our athletes get lost in the mix of selfies and passive aggressive political posts! Still with us? Great! Here’s a step by step on how to make sure you never miss a beat! STEP 1: Open the Facebook app on your iOS device and tap the More button located in the bottom-right corner. 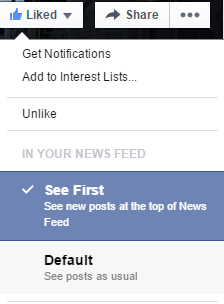 STEP 2: Next, scroll to the bottom and select News Feed Preferences. STEP 3: Tap “Prioritize who to see first”. STEP 4: Now choose the LINE Skis FB page! Step 5: If you are using a desktop, you can go to the LINE Skis page, click on the “Liked” tab, then select “See First” to see our posts in your feed as soon as they go live! Android users will have to wait for a FB update on Google Play. PS: Shoutout to Newschoolers for the awesome play-by-play that inspired this post! Make sure you’re following them too! Next PostNext Eric Pollard’s Art – Now Available!